The South Korean-made Samyang 16mm is well corrected, but lacks the peak sharpness levels and lower distortion of the full-frame Zeiss 2/24mm (24mm f2.0). If the $1250 asking price of the Zeiss is difficult to justify, Samyang’s high-speed 24mm f1.4 at just $600 model brings up the rear with 21 points, but has lower sharpness levels and slightly higher, more noticeable distortion. If lens speed isn’t critical, however, and you have no need for a full-frame model, the 16mm f2.0 at just $479 is difficult to overlook. Although the Sigma’s peak sharpness is lower than expected, sharpness is good from the initial aperture centrally at least, and improves on stopping down, mainly in the outer field. However, the Sony DT 35mm 1.8 SAM and the full-frame Sony 35mm f1.4 G perform as well or slightly better in terms of sharpness when stopped down. The high-speed G series Sony has excellent sharpness across the frame at f/5.6, but it comes at price. With very high lateral chromatic aberration at all apertures and a hefty $1369 ticket, it’s not as easy to recommend as the Sigma, or even the slower Sony DT model. 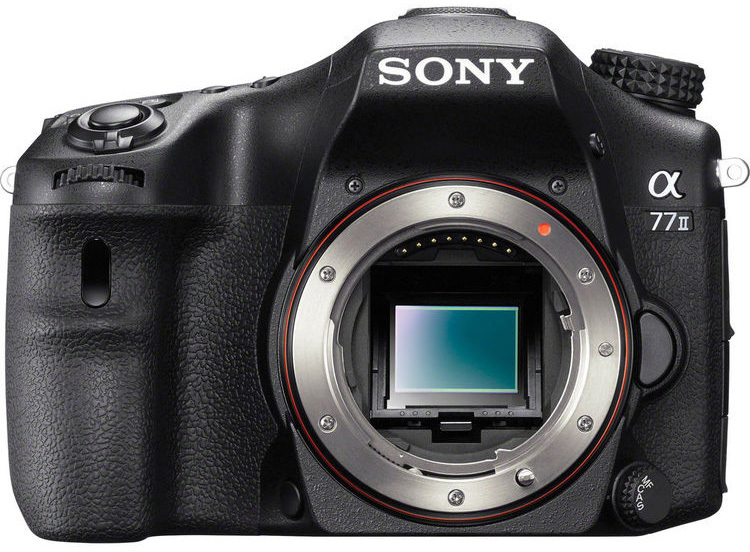 Sony offers a smaller, lighter and cheaper alternative in the Sony DT 16-50mm f2.8 SSM. While peak sharpness is marginally lower, the Sony DT 16-50mm has excellent sharpness from f/4 onwards at any focal length, and it is good wide-open from 16-35mm. The exception is wide-open at 50mm, where sharpness drops off, but at f/4 it is sharp again right across the frame. If the budget doesn’t extend to the $750 for the Sony DT 16-50mm, the Sigma 17-50mm f2.8 EX DC HSM is a sensible and convincing option. It offers a similar focal range, but it is not nearly so good as the Sony wide-open. Stopped down a little, however, like most lenses it performs well, with good sharpness and low levels of chromatic aberration. 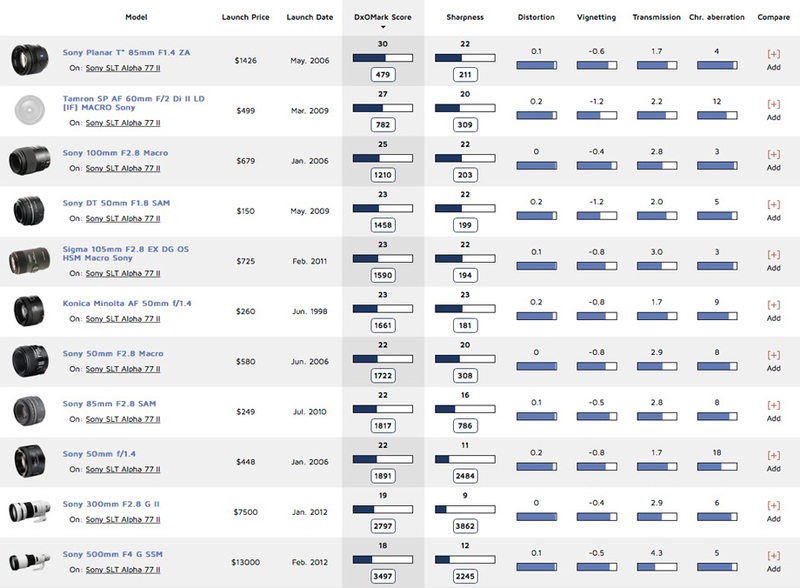 Six of the 28 models fall in the telephoto-zoom category, and of those, five are full-frame. The Sony DT 55-200mm f4-5.6 SAM model tested here is the only model of the six that’s purposely designed to cover the APS format, and although it has since seen a revamp, it adopts the same optical construction, and so the results should be still be applicable. Sony has also slightly updated the 70-200mm f2.8 G SSM (equivalent to a 110-310mm on the Sony A77 II) with an SSM II that heads this category as the best-performing model. But weighing in at $1799, that shouldn’t be too surprising. With only minor updates and no difference to the optical configuration, that too should perform similarly on the Sony A77 II. This entry was posted in Reviews and tagged DxOMark. Bookmark the permalink. Post a comment or leave a trackback: Trackback URL.